I’ve always said I’m someone who does CrossFit but only dabbles in running! But to the CrossFit community, who views one mile as a major distance, I am a runner. And to the running community, who views that same mile and chuckles, I simply dabble in their sport. In the end, I’m ok with either label as long as I get to enjoy and push my limits in both sports. 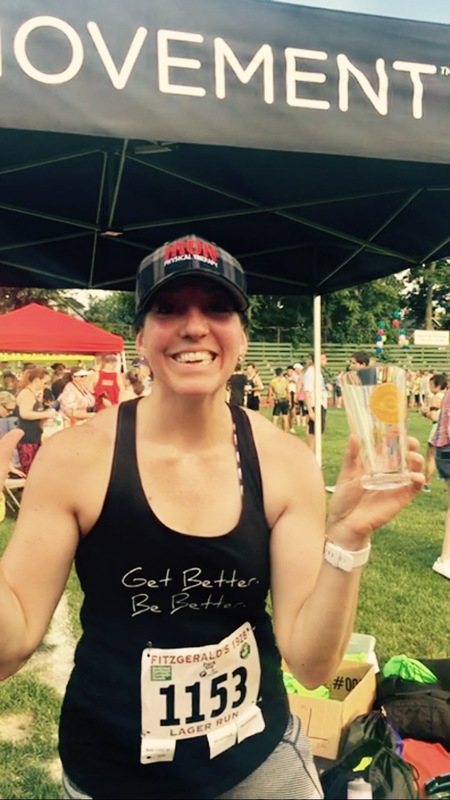 So when I received a “Top 100 Finisher” glass at the Fitzgerald’s 5K this summer, I got a lot of questions about how I maintained my race pace given that I only run twice a week. My answer is pretty simple…I do other stuff. I'm sharing four ways that I have built speed over the years without increasing running frequency. You’ve probably been told to run smarter, not harder, but what happens when you want to run harder, but not farther? At the beginning of a run, I would always take a lot of time to increase speed before finding a sustainable pace. But by repeatedly practicing short bursts of sprints between weightlifting at CrossFit, I’ve developed greater acceleration out of the gate. Now, I’m able to start a run with more momentum and establish a better pace early on. I love running in the park, but the one near me is mainly flat. That’s perfect for an easy, long run; but to improve speed, I incorporate hill work. That’s pretty easy for me since I live on a VERY steep hill where I have start (steep short climb) or finish (long moderate climb) my run on an incline. This type of hill work builds up all your leg muscles as well as your physical and mental endurance. Consistent weight training with a challenging load has built strength and stamina in my legs and core which has helped me power through more miles without having to run more often. Once you start strength training, you’ll be amazed at how easily you can increase pace/mileage without increasing running frequency. What has probably helped the most is the wide variety of movements and lifts we do at the gym. CrossFit was created to focus on developing the 10 components of fitness pictured above. With varied movements like squats, pull ups, push-ups, rowing, core, etc, I am always challenging my body in different ways which has helped minimize injury and build a wide base of physical skill and competence.